The Bible is full of persons who wrestle with God. As they stumble in their lives, they love and adore their Lord. They also scheme, lie, cheat, steal, quarrel, and fornicate. Abraham, the faith model for Jews, Christians, and Muslims, tells Sarah to lie; Sarah scolds God for ignoring her; Amnon rapes his sister; Judas recognizes Jesus’ unconditional love for him; Mary thinks that by distancing himself from her, Jesus hammered a spike into her breast; Peter’s wife crawls into their bed and snuggles up; Jesus’ relatives think he is crazy. In a word, as seekers of God the biblical characters mirror our lives. Like Jacob we limp away from the wrestling match. Kilian McDonnell, OSB, is a monk/theologian of Saint John’s Abbey, Collegeville, Minnesota. He is the author of three other books of poetry: Swift, Lord, You Are Not, Yahweh’s Other Shoe, and God Drops and Loses Things (Saint John’s University Press). Kilian McDonnell has blessed us with a fourth offering of his very original and descriptive peeks into the lives and thoughts of biblical persons, monks, and even God. In his poems, readers see familiar personages in ways that they had never imagined. McDonnell has the ability to offer rich sensory experiences in minimal words. Using only ten, he describes a camel so well that readers will not only see it; they will also feel, hear, and smell it. This multi-sensory imagination gives a keen tactile reality to many of his poems; e.g., the scratchiness of Peter's beard; the burial sheet stiff with dried blood. 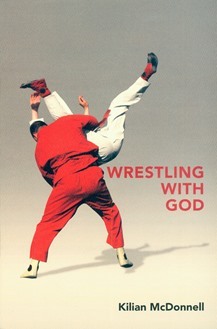 Father Killian McDonnell's Wrestling With God is the work of a gifted poet and a man of profound faith. Nearly every poem in this collection, mostly inspired by Biblical figures or experiences, dramatizes the doubts and struggles of familiar personages: Peter and Andrew, adrift on the stormy sea of Galilee; Mary, the Mother of Jesus, puzzling over her son's abruptness at Cana; Mary Magdalene, Judas and many others. The language of these poems is both vivid and provocative in its detail and everyday diction. Wrestling with God will provide readers with a fresh view of Scripture while deepening their understanding of the role of the divine in human experience. When reading Kilian McDonnell's Wrestling with God, Ezekiel's desert vision comes to mind, for here we see bare-boned characters from the Bible given new flesh and breath by a gifted poet. Part of McDonnell's gift is his uncanny ability to find the intriguing moment to focus on his subject. For example, in these poems, we meet Mary as she wonders if she is missing something because her son is celibate at the age of 25, and, at the period between the crucifixion and resurrection, we watch Peter decide to give up and go fishing. These poems at times can be violent, comic, sensual, and even ecstatic, but they are all thought-provoking explorations of doubt and faith that deserve a wide audience.